The Ghosts are special forces prepared to face any conflict, no matter how challenging it is. They have successfully torn apart the powerful Santa Blanca Cartel, turning their organization into little more than ashes, but now they will have to face the greatest challenge they ever experienced: a combat situation with a ruthless enemy who pursues them without hesitation. Welcome to Fallen Ghosts. This expansion, featuring new missions, weapons, skills, and enemies, will be available on May 30 for the season pass owners, and on June 6 for individual purchase. 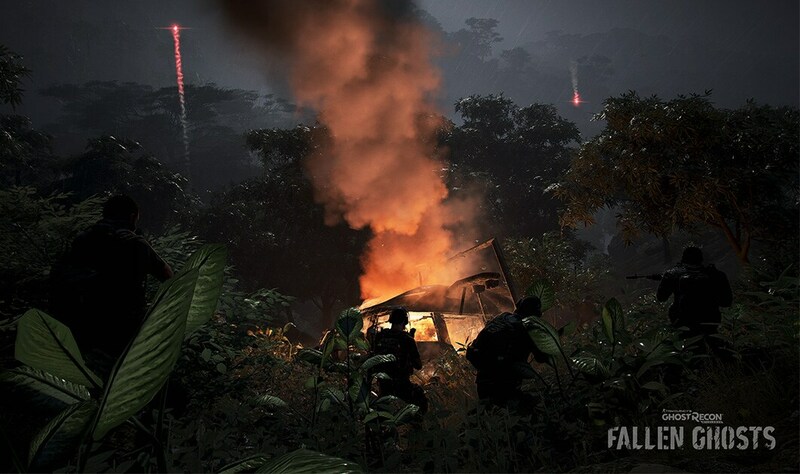 After the fall of the Santa Blanca Cartel, Unidad’s military force is unable to contain the chaos created by the Ghosts. Santa Blanca’s disorganized members search for revenge and the rebels are trying to take back control of cocaine production. In order to help restore order in the country, Unidad enlists the most dangerous volunteers, disgraced ex-military special operations and ex-cartel members from various Latin-American countries, giving birth to a unit specializing in the most brutal operations: Los Extranjeros. Before leaving the country for good, the Ghosts have one last mission: they need to evacuate the last CIA members and American civilians remaining in the country. On their way in, their chopper is shot down and they crash in the middle of the jungle. They are now chased by enemies better equipped and stronger than them…so they will need to play smart if they want to survive. The new Fallen Ghosts campaign features 15 new missions in which you will face four new bosses located in three different regions. As with the main game, you have total freedom of choice in the way you complete the missions, either by controlling your AI squad alone or by joining up to three other players in co-op. The new missions will test your combat skills and the coordination with your team: you will have to eliminate lieutenants, defend civilians, and extract VIPs, all to work your way through to the heads of each region. In addition to the main missions, Fallen Ghosts will also incorporate new side missions scattered around the map. If you complete all the missions of a specific type, you can unlock a final activity that grants you exclusive prizes upon completion. But these are not the only changes: for those of you who love a good challenge, the Advanced and Expert difficulties have been tweaked to offer a greater challenge. Turn off the HUD and immerse yourself in the most extreme tactical experience you can experience in Tom Clancy’s Ghost Recon Wildlands. 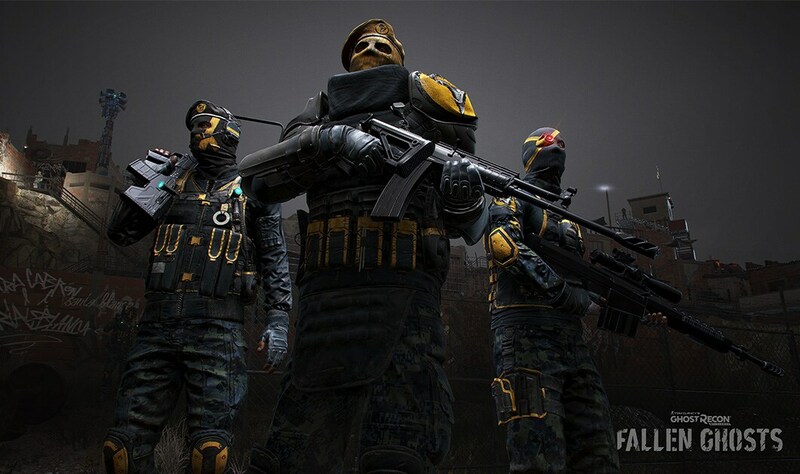 During the events of Fallen Ghosts, your squad will be pursued by Los Extranjeros. Operating under the government protection gave them access to the latest combat technology so, for the first time, the Ghosts will not be the ones equipped with the most advanced tools. You will have to deal with four new types of enemies and each one of them will require a different approach. Armored enemies wear heavy bulletproof vests and will be hard to kill in close combat; Elite Snipers have a wide detection range and unbeatable aiming skills; the Jammers have an interference antenna equipped on their backpacks that disables all your electronic gadgets; and finally, the Covert Ops will test your detection capabilities with their advanced optical camouflages and their silent but lethal crossbows. They are implacable, and they will push the Ghosts to their limits. Luckily, the Ghosts will have some resources to face this new threat. 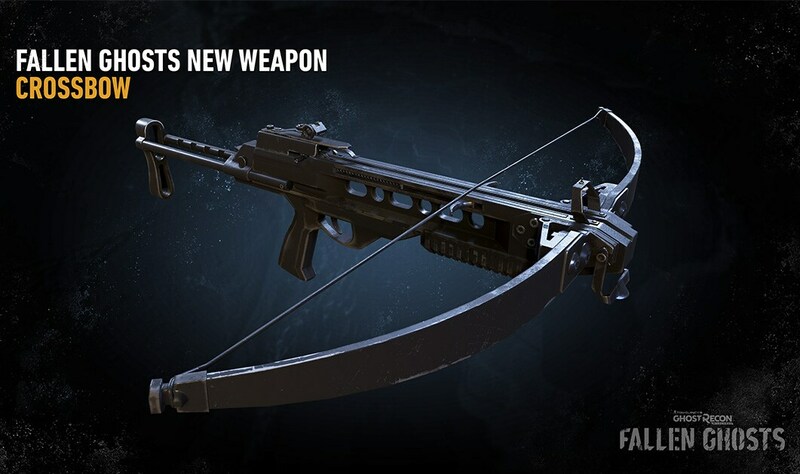 Fallen Ghosts includes 25 weapons, including six new exclusive ones, featuring assault rifles, sniper rifles, and even a crossbow that can be equipped with explosive arrows. Additionally, you will also be able to get more than 10 exclusive legendary versions. - Drone Updates: The best friend of the Ghosts is now updated with even more tactical options. - Flash Drone: Transform your drone into a mobile flashbang grenade that will repeatedly trigger blinding flashes. - Attack Drone: Attach a small-caliber shooting device to your drone to transform it into a lethal flying weapon. - Drone Vengeance: Equip it with an explosive payload that will activate automatically when shot down by an enemy. - Physical Skills: Tracked and hunted down, you’ll be forced to unleash your inner Ghost and improve your reflexes to survive. - Oxygen: Improve your ability to swim underwater for a longer time. Stay undetected and find new stealthy ways to attack your enemy. - Reaction Marking: Improve your senses and tag every enemy shooting at you. - Explosive bolt: Equip your new crossbow with explosive bolts. More deadly, less silent. - Fast Reload: Increase your dexterity and reload your weapons faster. For those of you who mastered the campaign, Fallen Ghosts should test your tactical and combat skills to the limit, either solo or with friends. We really hope you will be up to the challenge, Ghosts, because Los Extranjeros will show no mercy.